I am a huge fan of this great shower brush. I have had some mobility issues due to some joint pain so sometimes it’s hard to reach my back in the shower, but with this great shower brush from Luxy Beauty Care I have no problems at all!! It works so well. It has a great long handle that allows you to reach just about anywhere with ease! It’s really comfortable to hold and even has indents for your fingers to lay. The bristles are really soft and feel great on your skin, very well secured and will not be falling out on you. On the reverse side there are little nobs so you can even do a message on yourself!! It feels great and is so easy! They come in fun colors, I got the blue one which is my favorite. Color is very vibrant and looks great in my shower. It comes with a string attached so you can hang it, I leave mine hanging in the bathroom so it can air dry between uses and it’s really convenient. Our skin, the largest organ in the human body, has a crucial function in eliminating toxins of the body. Did you know that 1/4 of your body’s toxins are removed through the skin? Imagine that your pores are blocked by dead cells or other impurities. You skin would not be able to excrete those toxins. This is one of the reasons brushing helps to unblock pores and improves the removal of toxins and impurities that are trapped in your skin. BRUSH YOUR SKIN FOR A BETTER HEALTH – Skin brushing improves the surface circulation of the skin and keep the pores open, encouraging your body to release toxins, impurities, and metabolic wastes. Brushing will not only help increase circulation and excretion of toxins, but will also make a huge difference to the quality of your skin and it will look and feel healthier. 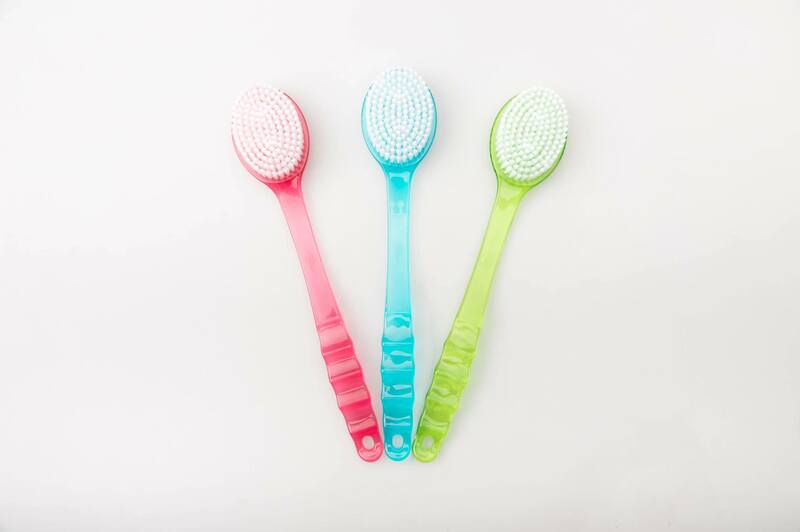 HIGH QUALITY BATH BRUSH – Our long-handled bath brush has a great firmness without being too stiff and rough. The bristles are soft and it’s just the right length to reach all of the spots. Excellent for wet use in Bath or Shower, or as dry skin brushing. It is also great as Cellulite Massager or Back Scrubber.